431 Marlborough is located on the north side of Marlborough, between Massachusetts Avenue and Charlesgate East, with 429 Marlborough to the east and 433 Marlborough to the west. 431 Marlborough was built in 1885 for Chadwick & Stillings, for speculative sale, one of eight contiguous houses (431-445 Marlborough). Chadwick & Stillings (N. Henry Chadwick and Oscar L. Stillings) was a hat block and flange company that became a significant house building firm in the 1880s and 1890s. They are shown as the owners, architects, and builders on the original building permit applications for 431-445 Marlborough, dated June 16, 1885. 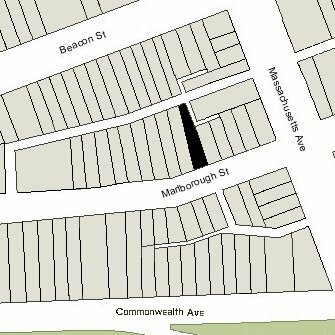 Click here for an index to the deeds for 431 Marlborough, and click here for further information on the land west of Massachusetts Avenue between the south side of Beacon and the north side of Commonwealth. On July 1, 1886, 431 Marlborough was purchased from Henry Whitney by Susan Aldrich (Aborn) Watson, the wife of David Saxton Watson. They previously had lived at 5 Rutland Square. David Watson was a wholesale grocer specializing in teas, coffee, and spices. 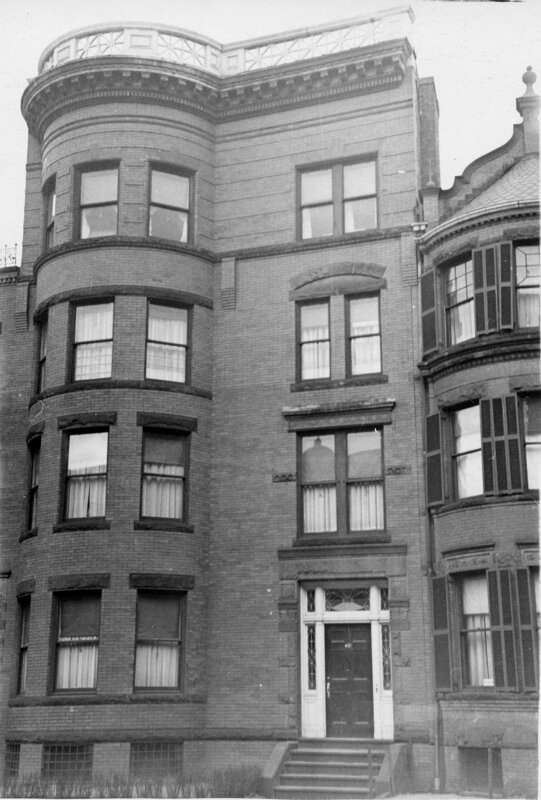 They continued to live at 431 Marlborough during the 1891-1892 winter season, but moved thereafter to 803 Boylston, where he died in August of 1893. 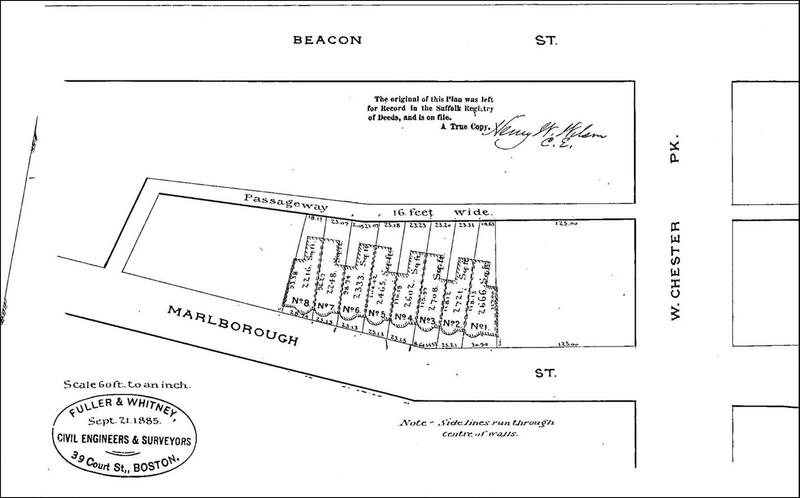 On June 18, 1892, 431 Marlborough was purchased from Susan Watson by Julius Eichberg. He and his wife, Sophia (Mertens) Eichberg, made it their home. They previously had lived at 101 Pembroke. Julius Eichberg was a composer, violinist, and music educator. The former director of music at the Boston Museum, he was director of the Boston Conservatory of Music and supervisor of music for the Boston Public Schools. Julius Eichberg died in January of 1893, soon after moving to 431 Marlborough. Sophia Eichberg continued to live at 431 Marlborough. By the 1896-1897 winter season, she had been joined by their daughter, Annie Philippine (Eichberg) King, the widow of Tyler Bacheller King. In August of 1898, Annie King married again, in England, to publisher John Lane. After their marriage, they lived in England and by December of 1898, Sophia Eichberg had moved there as well. Annie (Eichberg) King Lane subsequently became a novelist. 431 Marlborough was not listed in the 1899 Blue Book. On January 24, 1899, 431 Marlborough was purchased from Sophie Eichberg by Elizabeth Searle (Davis) Sprague, the wife of boot and shoe dealer Edwin Loring Sprague. They previously had lived in an apartment at 409 Marlborough and, before that, at 31 Hereford. 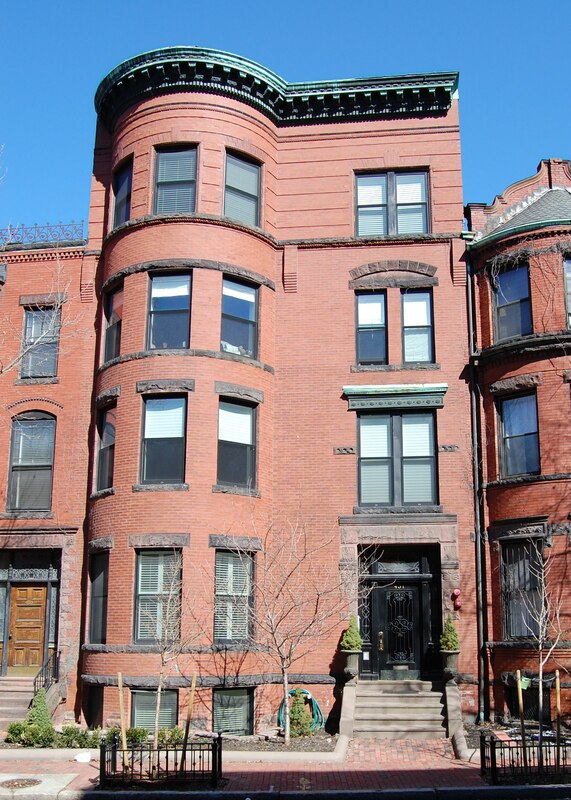 The Spragues continued to live at 431 Marlborough during the 1900-1901 season, but moved thereafter to Brookline. During the 1901-1902 winter season, 431 Marlborough was the home of Charles Albert Read, Jr., and his wife, Ellen Arvilla (Hatfield) Read. They had spent the previous winter at 131 Marlborough. Their principal residence was in Manchester. By the 1902-1903 winter season, they were living at 217 Beacon. By the 1902-1903 winter season, 431 Marlborough was the home of Dr. Walter Elijah Reid, an osteopath, and his wife, Abbie J. (Wrisley) Higgins Reid. They had married in July of 1902, and 431 Marlborough probably was their first home together. They continued to live there during the 1903-1904 season, but moved thereafter to Brookline. Elizabeth Sprague died in February of 1904, intestate, and 431 Marlborough was inherited by Edwin Sprague and their four surviving children: Edwin Loring Sprague, Jr., Ruth Davis Sprague, Henry Bancroft Sprague, and Richard Warren Sprague. On June 23, 1904, 431 Marlborough was purchased from the Sprague family by Fannie Marie (Doane) Rumsey Erhardt, the wife of Justus Erhardt, an instructor at MIT. They previously had lived at 1069 Boylston. They continued to live at 431 Marlborough during the 1914-1915 winter season, but moved thereafter to Brookline. On March 10, 1915, 431 Marlborough was purchased from Fannie Erhardt by Marion (Jordan) Bentinck-Smith, the wife of William Frederick Bentinck-Smith. They previously had lived in an apartment at 220 Marlborough. They also maintained a home in Cotuit. William Bentinck-Smith was Secretary of the Arctic Coal Company and also served as trustee of the estate of his wife’s grandfather, Eben Dyer Jordan. William Bentinck-Smith died in August of 1924. Marion Bentinck-Smith continued to live at 431 Marlborough during the 1925-1926 winter season, but moved thereafter to Milton. 431 Marlborough was not listed in the 1927 Blue Book. On March 5, 1927, 431 Marlborough was purchased from Marion Bentinck-Smith by stock and bond broker Prentiss Shepherd. He and his wife, Ellen Williams (Eldredge) Shepherd, made it their home. They previously had lived in Wellesley Hills. Prentiss Shepherd died in November of 1962. Ellen Shepherd continued to live at 431 Marlborough until the mid-1960s. In April of 1967, Milton B. Popkin, probably in anticipation of purchasing 431 Marlborough, filed for permission to convert the property into a lodging house. His permit was denied and the Board of Appeal dismissed his appeal. On April 10, 1968, 431 Marlborough was purchased from Ellen Shepherd by architect Donald L. Stull and his wife, Patricia A. Stull. In August of 1968, he applied for (and subsequently received) permission to convert the property from a single-family dwelling into a single-family dwelling with an office. They subsequently lived at 431 Marlborough and he and maintained his architect’s office there. The Stulls separated and on December 16, 1983, Patricia Stull transferred her interest in the 431 Marlborough to Donald Stull. On February 7, 2013, 431 Marlborough was purchased from Donald Stull by the 431 Marlborough Street LLC (Peter McLoughlin, manager). In July of 2013 it received permission to convert the property from a single-family dwelling into a three-family dwelling. On June 11, 2014, it converted the property into three condominium units, the 431 Marlborough Street Condominium.